Most travelers heading to Wester Monolia fly give Uvs and Zavkhan aimags a miss, flying direct to Olgii to experience stunning Tavan Bogd National park. While Bayan Olgii is deservedly known as the jewel of West Mongolia, remote Uvs and Zavkhan aimags are home to vast landscapes, huge lakes, a number of mountains over 4000m (14,000ft), and some rarely-visited national parks for hiking and horse treks. Importantly, you're likely to have all this to yourself! 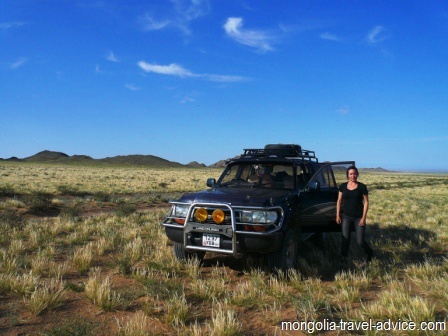 These are great aimags to travel across overland and great places to get off the beaten track in Mongolia! As a side note, it is difficult to arrange guides or drivers from Uliastai (capital of Zavkhan) or Ulaangom (Uvs). You'd be better off finding one in Olgii, Ulaanbaatar, or Tsetserleg. Otgon Tenger Mountain and Tarvangatayn Nuruu National Park"
Rolling grasslands in Zavkhan and Uvs are home to countless golden eagles, and the occasional herd of antelope. If you like big, open spaces punctuated by the odd rocky hilltop, lake, and occasional 4,000m+ snow-capped mountain, you'll love Uvs and Zavkhan provinces. 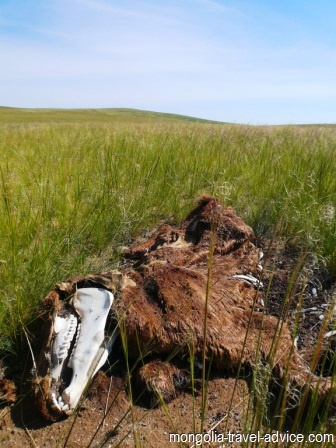 The provinces are part of the Great Lakes Depression (see my page on page on rivers and lakes in Mongolia for more information), meaning they are low-lying, sparesly vegetated semi-desert in most parts. But the lanscape is more rolling, and contains more interesting rock outcrops and mountains, than most of the Gobi Desert aimags. Few locals and very few tourists reach these aimags, so you're like to be able to explore them all to yourself. The aimags are home to wildlife such as antelope and countless golden eagles on the grassy plains, and sheep and ibex in the mountains. If you're wanting to travel to Olgii overland from Ulan Bator, I would recommend taking the Northern route after the Khangai mountains, through Zavkhan and Uvs aimags, than the faster (but flatter, busier, and more boring) route through Khovd, Govi-Altai, and Bayan-Khongor aimags. I've pasted some photos on this page, but my camera does not capture the great vastness of these aimags, or the strange satisfaction you get after going days without seeing other people. If you've got the time and a good four wheel drive (you need to be prepared because you can't rely on others passing by who can help you! 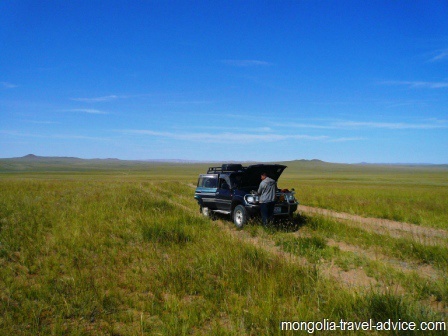 ), Uvs and Zavkhan aimags can be a real adventure. Town in Uvs. 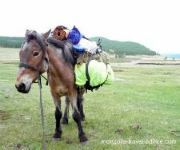 These aimags have a few very quirky, one-horse towns where you'll wonder how the locals manage to pass the time. I've included Uvs Lake (i.e. 'Uvs Nuur') in here because it's listed in the Lonely Planet as a highlight of Western Mongolia. However, as a rule lakes in Zavkhan and Uvs aimag tend to be pretty dull. Uvs Nuur is just a huge, open body of water, with a windy, dry and largely featureless shoreline home to little but a whole bunch of mosquitoes. Birdwatchers might want to roam around the shore to get a (distant) look at some of the birdlife, but for most travelers Uvs will make for little more than an okay sunset photo and a windy or insect-plagued camp. Uvs Nuur is worth seeing if you're in the area, but don't go out of your way to get there. If you're traveling through Ulaangom (capital of Uvs aimag) you'd be better advised to check out Kharkhiraa and Turgen Mountain (i.e. Uul) or Tsagaan Shuvuut Uul which are West of the town and far more interesting in my opinion. Khyargas Lake is another 'highlight of Western Mongolia' that doesn't offer too much for most travelers. I suppose the Lonely Planet feels compelled to identify particular geographical features as highlights, rather than just say 'a road trip through Uvs and Zavkhan aimags on the way to Bayan Olgii will be a really memorable trip for you'. Like Uvs Nuur, Khyargas Nuur is an endoherric basin (i.e. where rivers flow in and eventually evaporate) and is fed by the Zavkhan river. It's probably slightly more interesting than Uvs Nuur as it has more wetlands, but not by much. One group who should consider a stop by Khyargas Nuur, though, are those interested in fishing. The lake is home to a number of fish species, which come close to the rocky outcrops on the shoreline on calm days, so is definitely worth a visit if you're in the area. The landscape can dry out a lot in the low-lying areas of Uvs and Zavkhan aimags. The only things bringing in moisture are the rivers flowing in from the high mountains. Otgon Tenger mountain (4,021m), which lies to the east of Uliastai (capital of Zavkhan aimag), is one of the more popular mountains for climbing in Mongolia (though be warned that locals do not appreciate foreigners climbing it as it's considered holy). 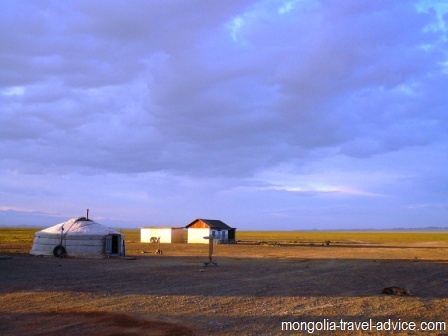 It is part of the Tarvagatayn Nuruu (mountain range), which is usually just considered an extension of the Khangai mountain range of Central Mongolia. Even for non-climbers, the whole Otgon Tener Uul strictly protected area is a great place for hiking and receives relatively few tourists owing to Uliastai's remoteness. The adjoining (i.e. 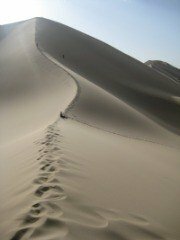 to the north east) Tarvagatayn Nuruu National Park doesn't even cop a mention in the Lonely Planet but covers a huge area and is a fantastic opportunity for self-sufficient hikers to plan a trip that takes in what is probably the least populated part of central Mongolia's Khangai Mountain range. There are a number of 3,000m+ peaks here in this area, plenty of rivers and lakes, and the landscape ranges from rolling grassy hills to rocky peaks and larch forests. All in all, an excellent and very much overlooked place for more adventurous horse riding or hiking in Mongolia! About 50km south west of Ulaangom (capital of Uvs aimag) lies Kharkhiraa (also spelled 'Harhirraa') and Turgen mountains, which are 4,037m and 3,978m respectively. Between the two snow-capped mountains flow the Kharkhirra river, which starts from a glacier and forms a wide, green, open valley which is excellent for hiking. Even in peak season, there are very low odds that you will see any other tourists here. On a clear day, a stunning view is afforded from the top of these permanently-snow capped mountains, and you'll get some great photos. I unfortunately only got to see these mountains from a distance, but i met a group of Swiss travelers who'd climbed up the valley to the peak of Kharkhirra mountain and they said it was excellent -they actually said it was more special than Tavan Bogd because it was so remote and isolated, if not quite as spectacular. Recommended! Uureg Nuur and Tsagaan Shuvuut Uul (3,496m) lie near the Russian border, not far north of the main road between Olgii and Ulaangom. Uureg Nuur is probably the prettiest lake in Western Mongolia outside Tavan Bogd national park, owing to the fantastic vista over the mountains on the north side rather than the lake shore itself -which is nice enough but, like most lakes in the west, severely lacking in tree cover. The mountains here are a bit more shaled and less watered and 'green' than Kharkhiraa and Turgen mountains, but would make a good enough place for a day hike. Uureg Lake's supposed to have decent fishing, probably mostly Lennok. Back from my Zavkhan and Uvs page to my West Mongolia page.